To kickoff Ohio State Week on the BusinessofCollegeSports.com I want to start by looking at the line item football budget. Check back each day this week for more Ohio State numbers, including recruiting expenses and overall athletic department budget. Below you’ll see numbers for both the 2010-2011 and 2011-2012 school years. These numbers were obtained directly from the Ohio State University athletic department. Please note this 2011-2012 budget was prepared before the events of this past weekend, so you can expect some changes, especially with regards to coaches salaries. Also, decisions on raises for all personnel have not yet been made. One thing to note as you take a look is that Ohio State has 7 home games in 2011-2012 compared to 8 in 2010-2011. Interesting to see how that impacts the overall budget both in terms of revenue and expense. Be sure to read after the chart to see how some of these numbers fit into the athletic budget as a whole. A few of the categories probably need clarification. A&P is Administration and Professional staff salaries. This category includes the salaries of all coaches. CCS is pay for Civil Service Personnel, who are support staff belonging to a union. Specials can cover a number of items from special event staff to incentives that may be paid to coaches as a part of their contract. I think it’s interesting to see all the expenses associated with running a top-notch football program like Ohio State’s. I won’t comment on many of the categories, but I wanted to let you see them all. As I noted earlier, Ohio State has one less home game for the 2011 season. Amazing what a difference one game can make. The loss of that one home game costs Ohio State roughly $3 million! As you can see, the two biggest expenses are salaries and grants-in-aid (payments back to the university for scholarships). Administrative and Professional salaries for football account for 18% of all salaries in that category in the athletic department, and grants-in-aid for football are nearly 22% of all aid granted by the athletic department. Football has the greatest number of athletes participating, so this should be no surprise. I often hear fans lament the great amount of money spent on football compared to other sports. However, football is the one sport where you can likely spend more to make more. Revenue from football accounts for 73% of all revenue generated by individual sports at Ohio State, and football is one of only two sports who turn a net profit. Later this week I’ll show you how the profit generated by football supports the athletic department as a whole, proving the investment in football is a wise one. Until then, you can read my previous piece on how “other sports” are funded. 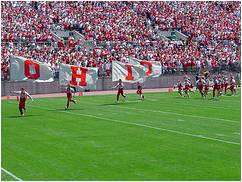 The Ohio State University Week! How Profitable is Ohio State University Athletics Department? How can A&P be $3.7M when Tressel’s salary was about $3.5M? I am told that only his base salary is included under football’s A&P, which would have been $652,000. The rest is included under a separate expense sheet in the full athletic department budget I have. Why does revenue add up to well over $65 million and is only listed at $51million? Visitor guarantees are listed under revenue but act as an expense against revenue. Subtract that number from the total you have and you’ll get the correct total. Are visitor guarantees only for non-conference opponents? Where do things like jersey & other memorabelia sales and things like using players likeness in video games and the like? not even close to real number, does not include royalties from jersey’s pennants, blankets, flags, lamps, etc. Licensing and royalties aren’t in the football budget. You can’t attribute a lamp sale to the football program. There is a line item for licensing and royalties in the overall athletic department budget. Great article on Ohio State sports revenue! Quick question, is bowl game revenue included in the totals reported above? Thanks! Where Can I find the Source to these Numbers? ?